These sunflowers sprouted from bird seed. I have no luck at all with the gorgeous hybrids, but without doing a thing, I get a wall of sunflowers all summer for bees and birds. We’re loving watching the lesser goldfinches’ acrobatics on the zexmenias and the purple coneflowers. Not when I have the camera, of course. Maybe I’ll be lucky enough to get a shot of hummingbirds and butterflies on the Dicliptera suberecta, since they certainly zoom in on this perennial. The Diclipteras took a hard hit the past few winters, but decided to stick around. Actually, I rather appreciated nature’s editing, since they can get a bit out of control. But I love that soft gray, velvety foliage even when they’re not blooming. Mine get blasts of harsh sun, but not for hours at a time. In my semi-shady beds, they add the tall silvery tone I crave. In the same part sun/part shade bed, bouncing bet (Saponaria officinalis) mingles with the lamb’s ears. I’ve also seen it growing like crazy in full sun. This sprawling, crawling perennial softens summer’s heat with sweet pale flowers. Its common name, soapwort, derives from the saponin in its roots. Crush the leaves and mix with water for homegrown soap. I squished a few leaves in my grubby hands, applied the water hose, and lathered up a storm. Next time, maybe I’ll add some mint to my “yard bath.” As Cheryl from Conscious Gardening says, “Neato!” Yep. Right now, water is the most refreshing sound and sight to both us and our desperate wildlife. If you’ve been thinking about a pond, fountain, or waterfall, immerse yourself in ideas on this year’s Austin Pond Society tour. 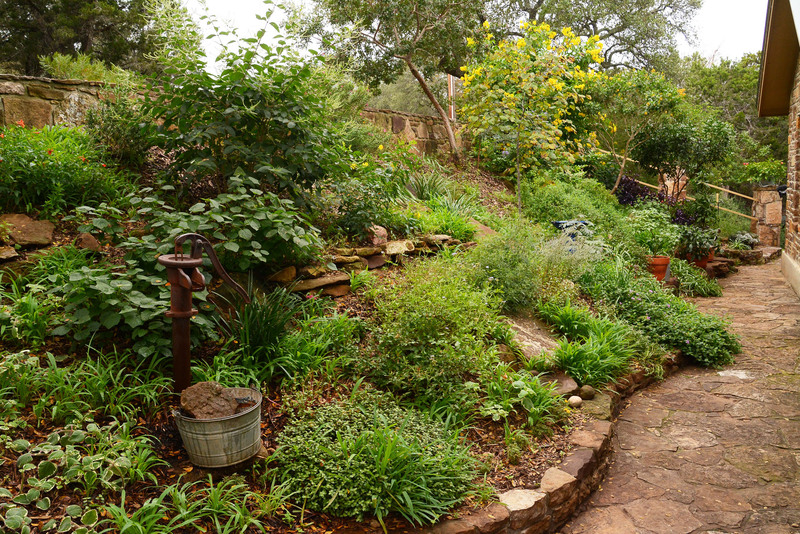 This week on CTG, Tom meets with Terrie and Michael Lumsden from the Austin Pond Society for a preview of just a few of the many gardens on June 11 and 12. And you can’t beat the price for passionate friendly hands-on advice from the gardeners. $15 in advance at selected nurseries, and $20 on site. The funds benefit their care of many public gardens. And, for the small ticket price, travel to a romantic paradise at Barbara and David Hale’s, CTG’s garden on tour. In their basic backyard, one weekend at a time, they pulled from Pond Society tours, their travels, and their imaginations to change a muddy, shady backyard and humdrum front into a daily vacation. And, check out their mosaics that dress up standard pots, cement benches and a front walkway! A few weeks ago, I couldn’t resist adding some old-fashioned periwinkles (annual vincas), reminiscent of my childhood, against ‘Helen von Stein’ lamb’s ears, verbena, Agave striata, and ‘Hot Lips’ salvia. With this year’s exceptional heat and high winds, I must water them every few days, until they’re ready to launch on their own (generally, they’re not water hogs at all). But planting too early ends up like this photo from Lisa Maddox. We thank Lisa for her great Daphne’s Question of the Week, since this happens to so many of us. Shoot, I haven’t planted periwinkles for years after I made the same mistake, since I’d heard that the disease never leaves the soil. And I learned my lesson on caladiums too! Nurseries entice us with periwinkles, caladiums, impatiens, and other heat lovers too soon. Yes, it may seem hot to us in April, but as Daphne tells us: the soil and nights are still too cool. The disease will remain in the soil, but you can plant again! Just wait until the temps are reliably in the 80s next May. And make sure you mulch around them to prevent the soil mold spores from splashing onto the leaves. This applies to tomatoes, roses and other susceptible plants, too. Thanks, Lisa, for helping us all out here! John Dromgoole explains how to use anti-transpirants like Wilt-Pruf, Cloud Cover and Vacation to help new plants get established. You can even spray your Christmas tree with Wilt-Pruf and Cloud Cover to keep its needles fresh longer. Vacation is the one to use on houseplants (and outdoor plants) when you spring out of here for two weeks!